The artist's impression shows what the two stars of the HK Tauri system might look like with their skewed planetary disks. Some of the oddly skewed orbits of many alien worlds may be due to the twin stars they are often found circling, a new study suggests. In our solar system, the orbits of most planets are nearly circular, orbiting the sun's equator. However, many of the exoplanets astronomers have discovered in the past two decades or so have mysteriously skewed orbits. They may be eccentric — that is, oval-shaped. They could also be inclined — tilted at an angle from the equators of their stars. Now, astronomers have captured the clearest picture yet of planet-forming disks around binary stars. They found these disks may be wildly misaligned around their stars, hinting that exoplanets may often be found in eccentric or inclined orbits from the moment they are born. The researchers made this discovery while surveying a series of binary stars using the Atacama Large Millimeter/submillimeter Array (ALMA) of radio telescopes in Chile. ALMA is the largest and most expensive ground-based astronomical project to date. The scientists focused on the two stars in the young HK Tauri system, which is about 450 light-years from Earth in the constellation of Taurus. These stars are less than 5 million years old and are separated by about 36 billion miles (58 billion kilometers), or 13 times the distance of Neptune from the sun. Stars and planets form out of vast clouds of dust and gas. As the material in these clouds contracts under gravity, it begins to rotate until most of the dust and gas falls into flattened disks swirling around stars. Eventually worlds are born from these protoplanetary disks. The star in the pair that looks dimmer, HK Tauri B, appears that way because the protoplanetary disk around it blocks out much of its light. The disk itself, however, can be easily observed by the visible and near-infrared starlight it scatters. ALMA data helped scientists produce this image of the HK Tauri system. Using ALMA's unprecedented resolution and sensitivity, the researchers successfully measured the rotation of HK Tauri A's disk. This revealed the two disks are tilted with each other by at least 60 degrees. This means that instead of being in the same plane as the orbits of the two stars, at least one of the disks must be significantly misaligned. "What was surprising to me was how clearly the result — misalignment of the disks — popped out of the data when we were first looking at it," said study author Eric Jensen, an astronomer at Swarthmore College in Pennsylvania. "That's partly a testament to the high quality of the data from ALMA, but partly a result of just how misaligned the two disks are with each other." Since material that will eventually form planets is in skewed orbits around these stars, the worlds that emerge from these disks may also end up in eccentric or inclined orbits. "Binary star companions may influence the orbits of planets, possibly explaining some, though not all, of the weird orbits we see among extrasolar planets," Jensen told Space.com. However, most exoplanets with skewed orbits are not in known binary systems. 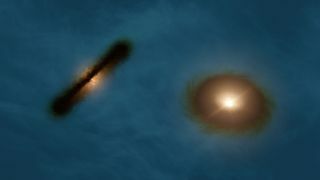 Data from the ALMA telescope array helped scientists realize that the twin stars of the HK Tauri system created a misalignment in their protoplanetary disks. "There are almost certainly some of these systems that have low-mass binary companions that haven't been discovered yet, but that won't be the case for all systems," Jensen said. "So while this binary-star-driven mechanism can explain some of the misaligned systems, it can't explain everything. That's an interesting puzzle that people are still working on." One probable mechanism for what causes exoplanets to have skewed orbits around solitary singleton stars is interactions among the planets in those systems. "If you form a lot of planets around a given star, especially if their orbits are pretty closely packed together, you are going to have interactions between planets, which can change their orbits," Jensen said. "In fact, even in our own solar system, people think that Uranus and Neptune have been pushed into wider orbits than those in which they originally formed, due to interactions with Jupiter and Saturn." In the future, the researchers want to look at more binary systems with protoplanetary disks to see how typical or atypical skewed disks are. Jensen and his colleague Rachel Akeson detailed their findings in the July 31 issue of the journal Nature.